I first heard the phrase, “Just Focus, Do It,” at Rapport Leadership. You’ve probably seen it in my Facebook status updates or tweets as, “JFDI” (although, my version of the acronym varies slightly). Either way, JFDI is a verb to me—it means taking action without making excuses. And, of course, it’s perfect for a hashtag. The power of focused intention combined with bold action will make huge changes in your life. And, a community that collectively focuses its intentions and takes bold action can change the world. Over 16 million children in America face an unnecessary struggle with hunger. This is inexcusable. Our nation has plenty of food, and we have the solutions to this problem. What we need collectively is more people with the will to JFDI. Right now, all across this nation, over 9,000 restaurants are participating in the Dine Out for No Kid Hungry. Our collective goal is to raise over 10 million dollars for the No Kid Hungry campaign, which aims to eradicate childhood hunger in the U.S. over the next few years. If we reach our goal, millions of meals will be provided for hungry kids in our own communities. Team No Kid Hungry is setting out today with a bold intention: Reach 16 million people online in one day with a call-to-action to Dine Out for No Kid Hungry. These children are voiceless, they’re not old enough to vote, and they can’t afford lobbyists. So today, we’re going to use our voices, our influence, and the super powers of the internet to give them a voice, some help, and some hope. We won’t stop today until we’ve reached our goal. There are many things we want to change in the world, and there are many things we’re making better. But, we also know we’ll be passing along many of these things to the next generation for them to solve. Childhood hunger in America will not be one of those things. September 19th will be our biggest Tweet-a-thon of the year THE TwEAT OUT. 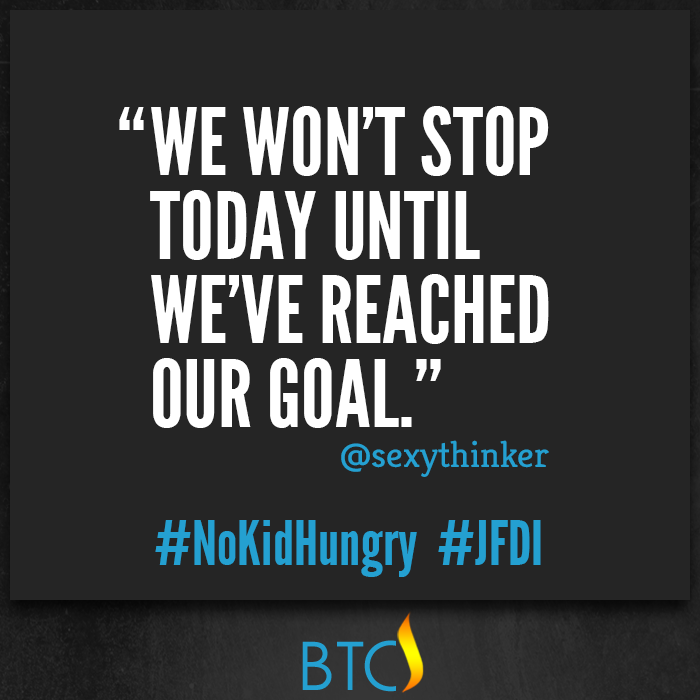 Our goal is to engage 2,000 Bloggers and Tweeters to help us promote the Dine Out For No Kid Hungry. We need your help! If you have a blog we’re asking you to post a blog like this one asking your community to participate in the TwEAT OUT! Restaurants have done their part by signing up to participate in this year’s Dine Out For No Kid Hungry. Now we need your help in making sure that you, your friends, and your family make the event a success by visiting participating restaurants September 18-24. To start the week with a bang, we’re holding a twEAT OUT all day on Monday, September 19. Join in the fun and help spread the word about Dine Out For No Kid Hungry on Twitter and Facebook! Retweet messages about the Dine Out For No Kid Hungry from these two accounts. If you haven’t seen this video please watch it now to understand the cause. Scott Pelly interview with children who struggle with hunger. Leave me a comment and let me know if you’ll be joining us!! (VIDEO ABOVE) News Anchor Scott Pelley presented an excerpt from a recent 60 Minutes segment “Hard Times Generation: Homeless Kids” at a Share Our Strength fundraising dinner. At the dinner Scott showed a video where he went to the Castlebury Middle School in Seminole County, Florida and spoke directly to students about their experiences with hunger. 1 in 4 children in U.S. will face hunger this year. Without the security of knowing where their next meal will come from, these children lack the energy to learn, grow and thrive. Share Our Strength is an organization committed to ending childhood hunger in America. The money raised through Share Our Strength’s Dine Out for No Kid Hungry September 18-21, 2011 will connect kids with nutritious food where they live, learn and play. Last year, many of us joined together to support Share Our Strength’s Dine Out for No Kid Hungry. Over 1,000 people spread the word online posting over 10,000 tweets about the campaign in just one week. Those 1,000 contributors helped Share Our Strength and the restaurant industry increase donations by 108%over the last year raising over 1.5 million dollars in 1 week. This year, the goal is 3 million dollars and to start we need to rally over 5,000 restaurant locations to participate in the program. Now it’s time to rally restaurants around the cause. 1. Save the date – June 21st and participate in Share Our Strength’s online “TwEAT OUT”(tweet-a-thon) On May 4, 2011, we asked our social media followers to help us reach our goal by asking their favorite restaurants to be a part of this national event. Here’s what happened.. On June 21st we’ll be tweeting using this hashtag #NoKidHungry and engaging on Facebook as well. Subscribe here to get more details as we get closer to the event. Thank you for using your online influence for good. Let’s go make the world a better place.